I have been in Holland many times and my first day I am always surprised by the bikes. That is bicycles not motor bikes, though they may as well be. Everyone in Holland owns a bike and they ride them as if they were on motorcycles. They have their own paths everywhere and if they don’t have the right of way they act like they do, or as my cab driver said as a bicycle was heading directly at us, “they ride in both directions and sometimes not the good one”! 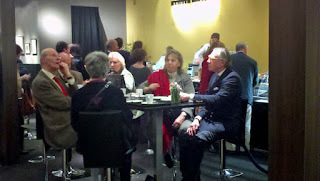 Wish I had one to go back and forth between TEFAF and my hotel. It would be far better than waiting and paying for a shuttle. vantage of the press badge is being able to get into the fair for 2 hours in advance of the throngs. It used to be that you could get into the opening by paying a premium at the door but it got so crowded that it is today by invitation only. Invitations are sent out by the TEFAF administration and mostly by the exhibitors. Pre-registered Museum groups are also welcome. Several people teased, ‘I can’t wait to read which your 5 favorite works of art are”. I did think of writing such a piece but during the quiet morning and after my third or 4th booth I listened to myself saying, “wow!” beautiful!” “I would like that” and realized this idea was not going to work. I had just begun and there are 261 dealers from 16 countries here, in I don’t know how many fields. I have never seen such a crowd as those waiting to get in (over 10,000 opening day and an estimated 73,000 by the time it closes in 10 days). As the main TV and Radio press wound up, at noon sharp the huge fair began to fill up with the anxious collectors and visitors, all looking as if they would starve unless they got immediate entry for food and drink, which the first day are free and served around the fair by waiters. On the following days there are restaurants ranging from cafeteria style to fine eateries. Rest rooms abound if you know where to look or ask. There is no reason to leave the Mecc (fair grounds) all day. It reminds me a little of a casino in the sense that you do not know the time of day. You really get into the art and the dealers minds who are there most of the time with their assistants to entertain your questions. If you are serious and sincere about what you ask you will usually get good answers. By the closing hours of the first evening there were a number of red dots, and in the cases where the dealer did not use dots, sometimes they told me about one or another sale. 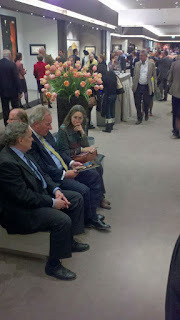 In one case a proud curator who had come with his director and trustees to TEFAF told me what they had bought and where. It was a good choice indeed. On the second day there were more dots and I heard few complaints from the dealers (most unusual ). Many museums come with their groups and by doing so can buy on the spot without waiting for consultations and meetings, another rare occurrence these days. TEFAF is one of the few fairs that I know of where the same pressure to buy exists as at an auction. Buyers must act or risk losing the piece they desire. 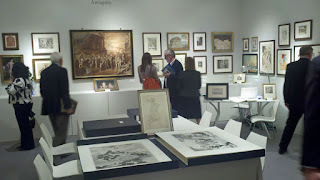 They act knowing the pieces presented at TEFAF are often the best of the best. They realize that the one big mistake would be not to buy, because paying too much is not the issue when buying the best… but that is worth a whole other blog! A good example is a piece of sculpture that a museum curator told me preview day that he wished he could buy for his institution but feared he could not raise the funds. The next day, a private collector proudly showed me a photo of the same piece just acquired. In two days I saw maybe a third of the fair thoroughly. For my last day I will go through the exhibitor map and list the exhibits that I feel I must not leave without seeing. I know there is much I will have missed.